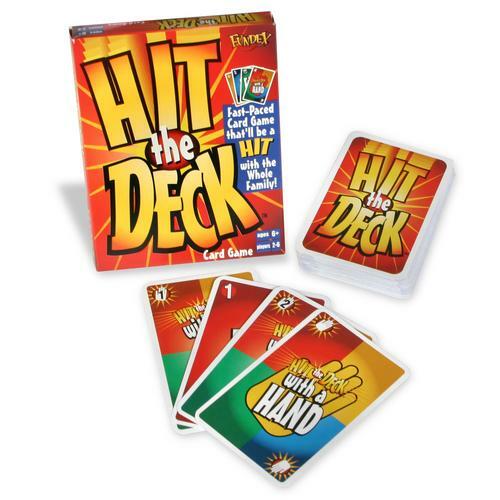 Hit the Deck is a cross between Uno and Slapjack. Players play their cards by matching colors or numbers of the card face-up in the discard pile. Like Uno, there are some wacky rules cards that shake things up a bit. Players try to play all of their cards until they run out, ending the round. The Hit the Deck rules recommend you remove all jewelry on your hands prior to play. You’re going to be smacking the deck, and rings and bracelets can hurt. Choose a dealer. The dealer shuffles the deck and deals seven cards to each player. The dealer places the remaining cards face down in the center of the play area. The dealer turns the top card over to create the discard pile. If it is a “Word” card, the player who goes first must perform the indicated action. If the first card in the discard pile is a “Hit the Deck With Hand” card, shuffle it back into the deck and pull a new card for the discard pile. Note, if the draw pile ever runs out, simply keep the top card of the discard pile the same, and shuffle the rest of the discard pile forming a new draw pile. Play begins left of the dealer and continues in this manner until modified by a “Word” card. On a players turn, play a card from your hand to the discard pile by matching either the color or number of the card on the discard pile (think Uno). If a player is unable to play a card from their hand, they draw one card from the draw pile. If the card is playable, it may be played, ending the turn. If the card drawn is not playable, the turn ends. There are five special cards in Hit the Deck. The following are the Hit the Deck rules for the special cards in the game. This card must be played onto a card of the same color. On the following player’s turn, they must pick up half of the deck, take the top card now revealed and place it onto the discard pile. Their turn ends, and they may not play a card. On the following player’s turn, they must pick up the deck and discard piles, flipping each over creating a new discard pile from the previous deck, and a new deck from the previous discard pile. Their turn ends, and they may not play a card. Play order is reversed, with action returning to the player who initially played the “Flip the Deck” card. Play continues in reverse order until it is flipped again. If the revealed card is a “Flip the Deck” card, shuffle it into the deck and place a new card onto the discard pile. If the revealed card is a “Hit the Deck With A Hand” card, the active player must yell, “Hit the deck with a hand,” and all players slap the deck with their hands (“Hit the Deck With A Hand” rules explained below). “Hit the Deck” cards are wild and may be played onto any number or color. The following player must play a card matching the number on the “Hit the Deck With A Number” card. If they cannot, they draw a card, playing if able. If a matching number is not played, the next player must play a matching number if able. Play continues in this fashion until someone matches the required number, returning play to normal. Though wild, “Hit the Deck” cards cannot be used to satisfy the requirement of a “Hit the Deck With A Number” card. The following player must play a card matching the color of the “Hit the Deck With A Color” card. If they cannot, they draw a card, playing if able. Play continues until a player matches the required color, returning play to normal. “Hit the Deck” cards cannot be used to satisfy the requirement of a “Hit the Deck With A Color” card. The last player to slap the discard pile draws four cards from the draw pile. If a player forgets to say, “Hit the Deck With A Hand” when they play this card, they draw four cards from the draw pile. If a player slaps the deck or discard pile when no “Hit the Deck With A Hand” card has been played, they have been faked out and must draw two cards from the draw pile as a penalty. Play otherwise continues as normal. The round ends when one player runs out of cards. This player scores a zero for the round. The rest of the players add up and record the total points in their hand with the following values: “Hit the Deck” and “Word” cards = 10 points; Number cards= face value. Play continues until one player reaches 100 points (or another agreed upon number), and the player with the lowest overall score is the winner.